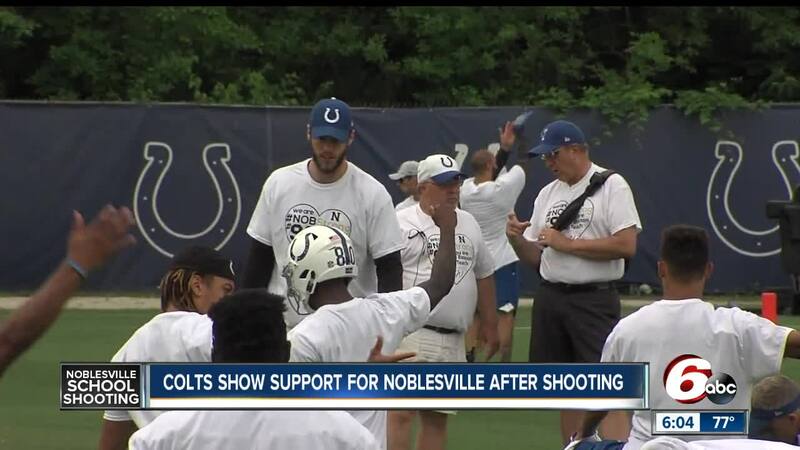 INDIANAPOLIS (AP) — The Indianapolis Colts arrived for practice Wednesday in T-shirts supporting a suburban Indianapolis community rocked by last week’s school shooting. Players and coaches wore the “Noblesville strong” shirts throughout their workout. Team employees pitched in by wearing them around the team complex. Two people were injured in the shooting, including Jason Seaman, a teacher and former FCS football player who stopped the alleged shooter at Noblesville Middle School. Colts offensive lineman Joe Haeg said he knew Seaman because they squared off in conference play. Seaman attended Southern Illinois and his college number, 91, was on the shirts. Haeg attended FCS power North Dakota State. The team says proceeds from shirt sales will be donated to Seaman and Ella Whistler, who was injured. All proceeds from the shirts will go to Jason Seaman and Ella Whistler, who were injured in the Noblesville West Middle School shooting on May 25th.